At the family run Four Seasons Hotel, Monaghan, travellers can enjoy excellent service, warmth and well-appointed accommodation. 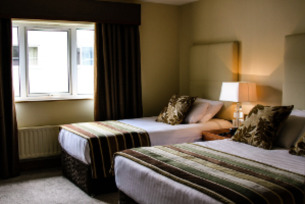 The four star hotel is located just 1km from Monaghan Town centre and accessible from the N2 carriageway. The Four Seasons Hotel is a family run business located just outside Monaghan Town. A four star, family friendly accommodation, it is an excellent access point for the northern part of the country, and is approximately 90 minutes from the cities of Dublin and Belfast. At the Four Seasons Hotel, all guests are received warmly and find well-appointed accommodation. There are 59 well-appointed bedrooms with everything needed for a comfortable stay, such as TV, WiFi access, direct dial telephone, ironing facilities, and tea- and coffee-making facilities. Guests can also avail of the hotel’s White Flag-awarded leisure facilities, including an 18m swimming pool, gymnasium, sauna, steam room, Jacuzzi and outdoor hot tub. Guests can also make use of room service, or there is also the Range Grill and Still Bar, which has a cosy turf fire, serves food throughout the day and features regular live music. The Four Seasons in Monaghan serves as a wonderful venue for a wedding. The Limewood suite is an exclusive venue for the wedding guests arrival, when it's time for dinner, guests move to the Seasons Suite to enjoy a superb banquet and entertainment. There are three suites, which can cater for parties from 30 to 330 guests. Additionally, the hotel is an excellent conference venue for two to 400 delegates. There are five conference suites with a range of facilities, including Internet access, air conditioning, screens, projectors, complimentary parking and more. Monaghan is home to some of the most picturesque lakes and hills in the world and is an ideal destination for fishing, walking, horse-riding and clay pigeon shooting. There are also several splendid golf courses and places of genealogical interest in the area.